It is about two similar murders, that take place over a hundred years apart. When Kate moves in with her husband, Joe Krause at his farm in Braxton County, Iowa, she's looking forward to a fresh start, a new home and a happy married life. But she finds a world full of gossip, lies, and a century-long family feud that started with the mysterious murder of Jacob Krause. As she deals with judgmental, meddling neighbours, a disapproving mother-in-law and a bad-tempered husband, Kate uncovers a long-kept secret. Making unlikely friendships along the way, Kate struggles against the curse of misfortune on the Krause family. The ending is great. The suspense is of the right kind: the answer is in front of you all along, you just don't see it! I read the book in two busy days; putting it down only when I absolutely had to and when I did, looking forward to reading it the whole time. With the feuding families, their legends of ghosts, the creepy cats, the antique music box, the old cabin that noone enters and all the hush about the past; the author has created an amazing aura of mystery that hooks you right in. She makes you curious, like Kate, every step of the way. With the cover, and the detailed description, it's easy to visualize the place and put yourself in it. Though the book would be shelved as a family drama, it's not mushy, depressing or too loud. The book has a lot to say about women and relationships. However, I do have conflicting views about the characters. I liked Rose, who wouldn't like Rose? She's exactly the kind of strong and exuberant character who adds flavour to a typical family drama. 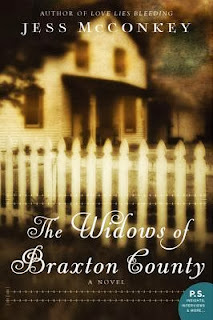 The old woman is Kate's mother-in-law's sworn enemy and is among the few friends Kate finds. I also liked Joe Krause, who seems lost, torn between protecting his family and his mother and loving his wife. He is a fuller character than Kate ever is. She's unrealistically naive and though she becomes stronger as the story progresses, the naivety sticks. The one thing that kept bothering me was that some key players in the story have the same names. The many generations tend to get confusing; Joe's ancestor is called Joseph as well, and his little step-brother, Willie has a descendant called Will. I would have loved it if the author had added an extensive family tree at the back, just to make all she's described even clearer. Being the kind of person that feels an inexplicable attachment to the past, I loved the book. If you like to browse through old prints, study family histories, wonder if the past ever really goes, or simply want to cuddle up with a nice mystery, I recommend this book. Seems like an exciting read. Harish - It really is! Dnyanada - Hey, I'm sure you'll like it. It's available on the new Amazon.in too!